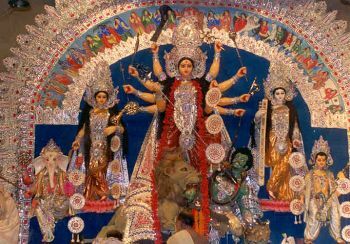 Durga Puja is the biggest festival of Bengali Hindus. It is the year’s most major Hindu festival mostly celebrated in Bengal, Orissa, Tripura, Assam and other parts of East India as well as in Bangladesh. Although a Hindu festival, people from many religious backgrounds participate in the ritual. Held over a five-day period, more than 2000 pandals are set up in Kolkata alone — all clamoring for the populace’s admiration and praise. Bangladesh, with its 10% Hindu population celebrates the puja in many temples, with an estimated 18,000 puja mandaps set up across the country. Iti includes more than 140 pujas taking place in the capital Dhaka alone! Talking of India’s capital alone, every year over 500 idols in and around Delhi are immersed in the Yamuna River after the Puja is over. And, that raises the environmental concerns after all the fun and frolics of the celebration. Let us check in some facts and figures. Many idols are made of plaster of Paris that takes longer time to dissolve: it also reduces the oxygen level in the water. The use of baked clay, coconut husk, aluminium foil, clothes impedes the smooth flow of the river. Baked clay, which does not dissolve in water, raises the river bed level. The colors and polish on the idols are toxic in nature. Last year over 300 idols were immersed in the Yamuna during Durga puja. This included around 36 tonnes of paints and other chemicals. The offering also had around 15 tonnes of flowers, leaves, coconut husks, clothes and other puja material. It’s going to be worse this year, experts say. There are over 300 registered Durga Puja associations in the city. This year over 1000 idols will be immersed into the Yamuna. Idols are immersed in Okhla and Wazirabad. ‘There is a need to provide some respite to the river, which is already so filthy. 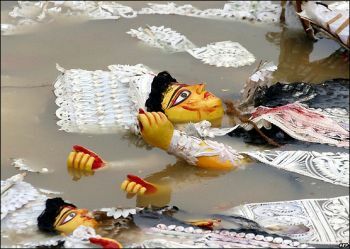 The immersion of idols leads to an addition of various pollutants, including dissolved oxygen, Bio-chemical oxygen demand, chemical oxygen demand, conductivity, turbidity, total dissolved solids and metals, hence there was a need to crack a whip,’ said a senior official of the Central Pollution Control Board. It has planned to educate idol makers this time. They will be asked to, and the NGO, Development Alternative will be guiding them on how to use non-toxic colors to paint the idols. They are also asked to use traditional clay — which is non-polluting — instead of baked clay. Idols should be made of traditional clay. Painted idols should not be used. Idols should be small as they would dissolve faster. Non-degradable chemical dyes are banned. Stress on natural colors used in food products. Prior to immersion, materials such as flowers, vastras and decorating items should be removed and collected for recycling. Wish You All, a Happy and Environment-friendly Durga Puja!! ← New multicolored bird found in India after more than 50 years!